DAYTONA, FL-Technological innovations and the forward-thinking people of NASCAR are placing each fan inside their favorite driver's car to feel the intensity and raw emotions that are inextricably linked with driving at 200 mph. A key component of that technology is the delivery of in-car audio for every Nextel Cup Series race, provided to fans via their cell phones or through a pay-per-use feature on NASCAR's website and provided to interested media outlets through dedicated feeds. 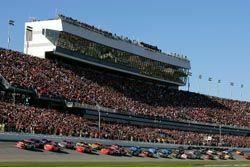 With the help of Symetrix AirTools 6100 Broadcast delays, NASCAR race fans are transformed from distant observers to virtual co-pilots by listening to clear and profanity-free, live, in-car communications. There is no requirement that NASCAR drivers refrain from swearing, and when things get tense, believe it or not, they sometimes utter profanities that would make the ears of an eight year-old race fan burn. Thus, NASCAR is obliged to police the in-car audio, and they do so with twenty-four highly reliable, simple to operate Symetrix AirTools 6100 broadcast audio delays. Daniel Braverman, president of Radio Systems, and his team integrated the system for NASCAR Images, the division of NASCAR that has the weighty responsibility of dispensing the sound and visuals for every race. Radio Systems is a manufacturer of professional radio broadcast equipment and the exclusive manufacturer of the StudioHub+ wiring and integration system. This is the system that allowed them to set up the elaborate in-car audio infrastructure in the span of a weekend in January 2007. From every track in the Nextel Cup Series NASCAR Images can uplink 48 channels of in-car audio to their site in Charlotte, NC, where all 48 channels are delayed through the twenty-four AirTools 6100s in AES/EBU dual mono pairs. The AirTools 6100 conveys every nuance, every bated breath, and every shout with a deep 24-bit, HD-compatible word length and 48 kHz sampling rate (synchable between 30 and 50 kHz). If the muscle of the in-car audio policing system is the rack of AirTools delays, then its brain is surely the sophisticated digital routing system manufactured by Seara Automated Systems of Burbank, CA. This digital router allows all of those channels to be connected in any conceivable matrix of inputs and outputs.